Even before opening my first storefront, selling online seemed like the ultimate dream. Now thanks to Etsy and other popular platforms, having your own virtual store is easier than ever. 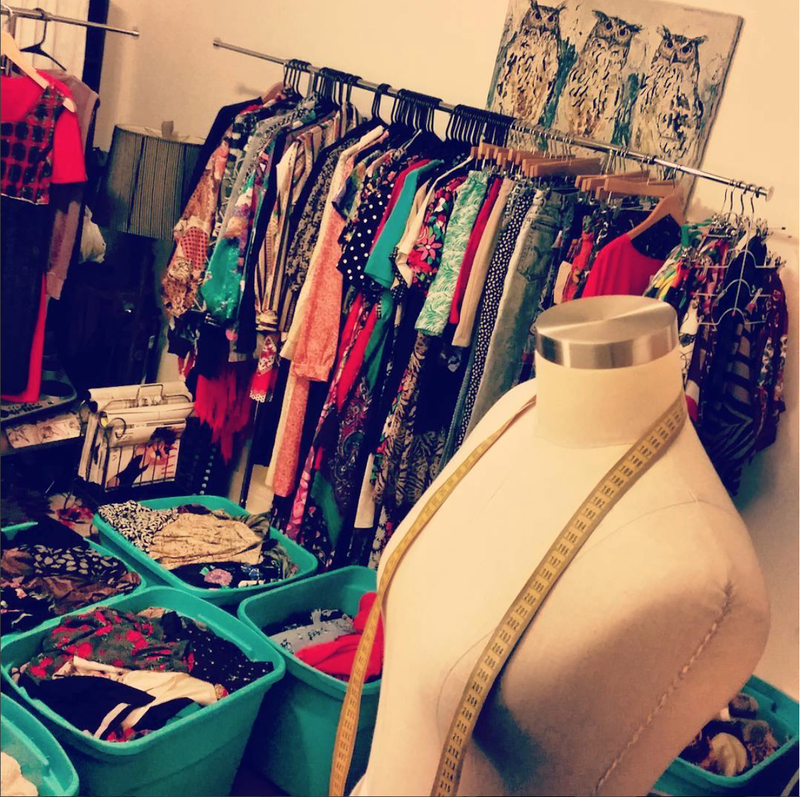 Part of the goal of this blog is to help other upcoming vintage junkies learn the ropes. Here’s a handy guide to what you’ll need to get started. 1.) Racks & Hangers – I went way too long making do with those cheap, crappy plastic racks. While they are fine to use for a photoshoot (hanging 10 – 20 items) they are disastrous for a larger load or for vending at a market. I recommend opting for metal ones with wheels, these are usually expandable and can take on a whole wardrobe. As for hangers: I’m a self-proclaimed hanger-snob and acquired my collection from a department store liquidation. They are wooden, I bought non-slip rubber grips to put on several of them, and my pants hangers match beautifully. They make me very happy. If you’re on a budget, plastic hangers are fairly cheap and can be sourced at any major store. Just shoot for matching ones, and please- don’t EVER use wire hangers. 3.) Mannequin/Dress Form – Let Craigslist be your friend, and guide you to someone that has an extra body lying around (hah!) Find what will work best for displaying your line without breaking the budget. If you’re planning to also use it to sew, a pin-able, clothe-covered dress form will allow for draping and garment assembling. Even if you plan to use a model, there are some pieces that might sometimes just look better on a mannequin. Be aware that this will likely be the only thing showcased in your store other than your goods, so choose wisely. 4.) Mending Skills – I know you may not be fashion designer, nor might you consider yourself anything close to a seamstress/seamster. However, in dealing with clothing, it’s imperative you have some very basic knowledge of garment repair. Learn how to sew a missing button, and a simple straight stitch to fix an undone seam. A machine is handy for fixing hems, but most mending can be done by hand. Remember, some issues come about (or are realized) after you’ve sourced the vintage, and a damaged piece means decreased value. 5.) Camera & Photoshoot Space – Chances are you’re not a professional photographer and you don’t have a studio. No worries, all it takes is an empty wall, backyard fence or just a table to shoot your goods. There are plenty of helpful tips available online to get you started with product shots. In my experience, the most important thing about shooting is just getting to it. Many variables can come into play capturing your vintage- off-site locations, models, weather, etc. What I’ve find that works best for me is having a consistent spot (in my home studio) to shoot garments on my mannequin or my own body. As you’ll find in many tutorials: opt for good lighting or use an external flash, be consistent in your approach and use and simple background for a professional look. 6.) Studio/Desk- The unglamorous truth about the online hustle is that we sit on our computers A LOT. Having a central spot to do listings, manage inventory and handle online duties will help immensely with your workflow. This space can also be where you prepare items for shipping, as long as you keep the service area clean and sparse. If you’re tight for room, a kitchen table even works fine, just be sure to keep your files, office and shipping supplies and other important notions in an easy-to-retrieve location. Keeping your business organized will keep you motivated to carry on. 7.) Storage Area – Like any other shop, you have inventory, and that needs a convenient, climate-controlled home. I keep my items sorted in large plastic bins (dresses, tops, bottoms, etc.) It’s amazing how much you can actually cram into those things (you see why I love my steamer.) Be sure to hang up anything delicate- sequins, silk, furs, etc. Accessories can also be stowed away, but you’ll want to be extra careful not to squish those together. I use accordion hooks along the wall of my studio for hats, belts and other pieces. I keep jewelry in small, clear plastic bags and tucked in a sturdy case. Shoes need extra care as to not be piled together- your best bet are shoe racks tucked into closets. Finding space for your collection might call for some extra creativity, especially if you’re just getting started. When I first opened my Etsy shop, I sold mainly housewares and had to tuck them away in trunks, unused cupboards and under furniture because I didn’t have anyway else to go with them. However your manage your storage, just be sure to avoid hot attics, damp garages and any other unsafe locations for your treasures. I hope these tips are helpful, and I’ll be sure to update if I think of anything else that I find pertinent to running an online/pop-up vintage clothing store. Feel free to share your tips and thank you for allowing me to share my passion with you. Happy vintage life!